Dynamic Kids is located in a beautiful renovated school building with ample parking, open green space surrounding the building and a playground on adjacent grounds. Conveniently located on Central Ave in Hartsdale, it is nearby many highways and shopping areas. Inside our suite, you will find a warm, welcoming child friendly environment. 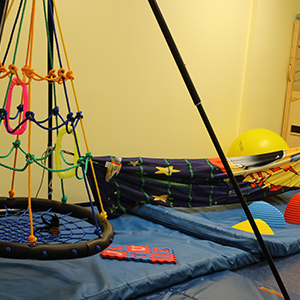 We have multiple sensory gyms, enhanced fine motor rooms, private speech therapy spaces and a dedicated room for early intervention treatment. 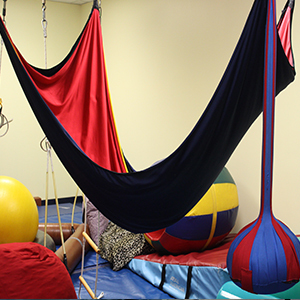 Our large gym allows for suspended equipment that utilizes many different swings (i.e. tire swings, frog swing, hot dog swing), bolsters, balls, climbing equipment and more. This provides children with the movement and sensory input to help work on strengthening, stability and gross motor skills. Obstacle courses are built using barrels, pillows, tunnels and a myriad of other equipment that can be tailored to any age and ability allowing to work on motor planning, self-regulation and coordination. Our second gym allows for tailored treatment for the younger children providing suspended equipment, climbing apparatus and a non-matted area for scooter boards and ball playing. The fine motor rooms allow for creativity with a huge assortment of art, building and fine motor games that work on hand strengthening, handwriting, crossing midline and motor planning. Many beautiful pictures, awesome letters and challenging projects are created here. There is an ever changing sensory bin allowing for multiple textures, smells and experiences to help with a childs’ sensory challenges. In addition, we have quieter rooms where older children can work on handwriting, keyboarding, fine motor development and motor planning, as well as specialized fine motor programs such as Interactive Metronome. Our move to this larger space has allowed us to continue to provide the successful therapeutic intervention Dynamic Kids is so proud of and has given us the opportunity to offer much more. We welcome parents to come and tour our facility and get a sense of what makes us so Dynamic. Please submit this contact form and a staff member from Dynamic Kids will reach out to you to schedule an appointment. "Many thanks for all you’ve done to help G. He’s come so far! As a parent, I know you know how comforting it is to find the right help for your child. I feel so blessed to have found your amazing center with such an incredible staff. " "We wanted to thank you for the tremendously positive impact you have had on all of our lives. We are grateful to have met you and are extremely grateful for all your hard work and patience and care you have given D. Your help has been life changing." "Thank you so very much for all your hard work with J. Your patience, kindness and knowledge helped him grow and gain the confidence he needs to succeed in school and life." "Thank you for teaching me." Click here for a schedule of Robbie’s seminar dates for 2016.